The growth of solar panels installed on the rooftops of homes and businesses is paving a way for startups to make and create services from energy storage technology. A German startup, PROSOL Invest Deutschland, has developed a lithium-ion battery system that comes with wireless communication to control home appliances. The company, founded in 2010, made its way to its first U.S. solar trade show, Intersolar in San Francisco, earlier this month, and attracted ample attention from attendees, some of whom noted that they couldn’t find similar technology unless they custom-build it themselves. The company has sold over 1,200 of its battery systems in Germany, Austria and Switzerland since 2011 through distributors and integrators such as Kyocera Solar and E.ON. “It’s not just a backup power system, but a smart system for the home,” Christoph Ostermann, CEO of PROSOL, told us. Energy storage promises to give increased flexibility to home and business owners who are using solar power on their rooftops. They can bank solar electricity for when they are not using it and then use that saved energy at night. They also can send power to the grid to take advantage of any incentives from their utilities. PROSOL is part of a growing number of companies that design battery systems to be paired with grid-connected solar energy systems. The number of solar manufactures and installers who market and install both solar and energy storage is on the rise, and includes SolarCity (s SCTY) and SunPower. Still, the solar-and-storage pairing isn’t common yet partly because a battery system tends to be expensive. 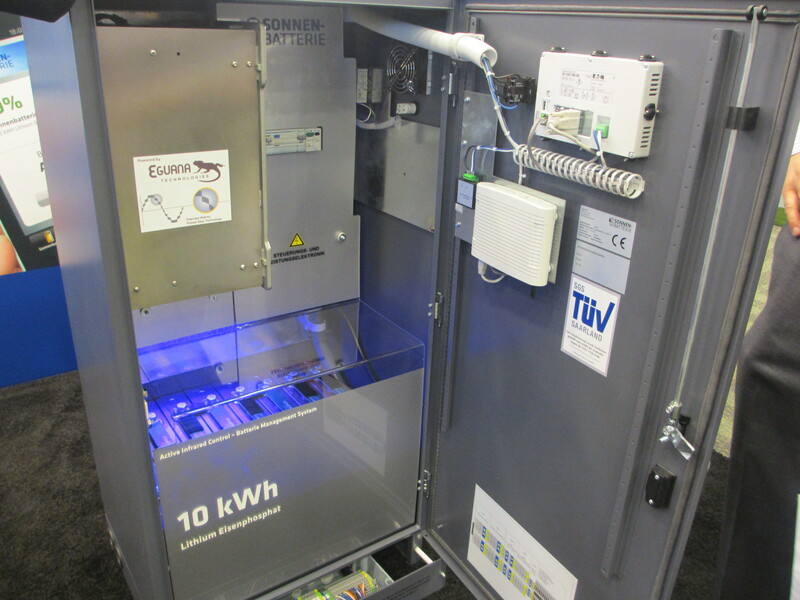 A PROSOL system, which is designed to pair with an array of solar panels, is a cabinet containing a bank of lithium-ion iron phosphate batteries, an inverter to convert DC power to AC and vice versa, a battery management system and a communication control panel that talks to appliances that are connected to a Z-Wave plug. 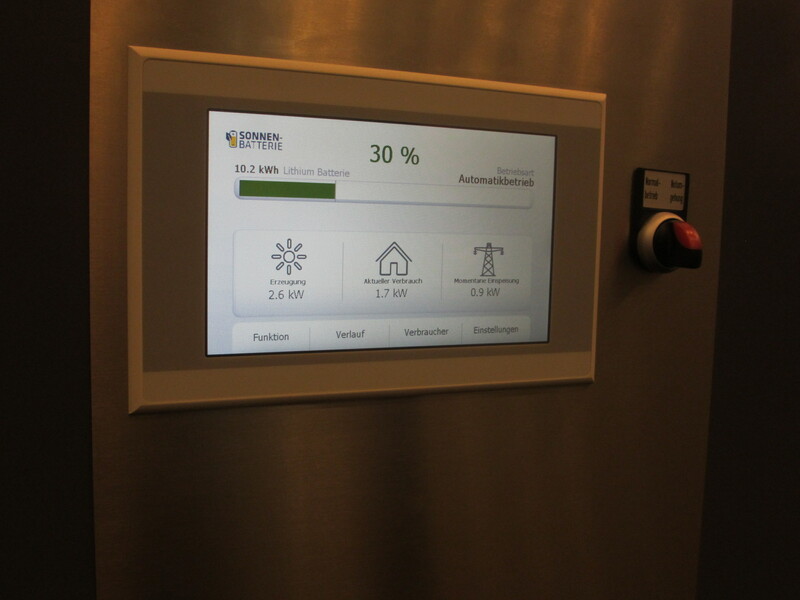 A 7-inch touch screen on the door of the cabinet displays solar energy production and home energy consumption. The startup’s core expertise lies in the software and controllers for controlling and monitoring the batteries and the engineering of the wires and cables in the cabinet to make it easy to install. The current system is designed to control up to three home appliances with a mobile app, which also shows home energy use and making it not just a place to store solar electricity but a home energy command central. The idea is similar to what Nest and other companies have been working on to control heating, cooling and other home devices to use electricity more efficiently. The battery system can control home appliances, and it’s developing software for controlling heating and lighting systems. The company’s energy storage systems come in different battery capacities for residential and business customers. It’s targeting the residential market with a 10 kWh system, for which it charges $18,000. A 60 kWh system costs $75,000. Given that batteries remain expensive, their use as solar energy storage won’t become widespread without government incentives. The German government started an energy storage incentive program in May that offers rebates to offset 30 percent of the price of a system and low-interest loans for installing both solar panels and energy storage, or for adding storage to an existing set of solar panels. Japan also put an energy storage rebate program in place, along with its renewable energy subsidies, after the Fukushima nuclear disaster in March 2011. California passed a law in 2010 to investigate the use of energy storage to complement the increasing amount of solar and wind power generation. Last month, the California Public Utilities Commission proposed to require the state’s top three utilities to sign contracts to collectively buy 1.3 GW of energy storage from 2014 through 2020. My point : Is a 10 kWh system enough for use in a normal residential situation ? The system size will depend on the energy consumption of the household and the intended use of the batteries. And, of course, it also depends on your budget (and the available government incentives). Tesla is building batteries at ~$150 kWh right now. Let’s just assume these guys have no scale and are doing 3x less well. A 10 kWh system at $450 per would cost $4500 + electronics and the inverter, maybe $9K total?!? At $18K, they’ll sell basically none of these. Maybe instead they work on selling a lot, driving their battery prices down to Tesla numbers, and growing margins from say 15-20% instead of seeking 50-70% out the gate to ensure they have basically no revenues. By the way, you can roll a Xantrex inverter into your system today and add batteries later. It might not have a fancy touch screen, but it also is sub $4K retail for a 6 kilowatt inverter (bigger than most people need, prices can be lower). Not that such a thing is currently a good idea in California, for example, anyway. You are better off selling your daytime excess to the utility and buying nighttime power for less on a time-of-use plan. I don’t know the costs of the various components, but you seem to know. The company’s IP is in its management and communication control systems. Does Tesla’s $150/kWh include the battery management electronics and software? The management system is part of Tesla’s core IP, but I don’t know if Tesla ever publicly put a cost/price on it. We do know Tesla’s first model was priced at over $100K. Speaking of inverters, a few battery system startups have designed their own inverters, and they told me they had to do that because they found off-the-shelve inverters inadequate. Thanks. Very interesting. Do Prosol have Net Present Value or ROI calculations? Or at least Net energy efficiency and expected number of power cycles of the system. There are some technical data and a contact form on its website: http://www.sonnenbatterie.de/en/strom-energie-speicher/solarbattery/technical-data/. You can pose questions to the company directly.